Yesterday, we went to visit my sister-in-law and her husband, Felice and Jeff, for the fourth of July, even though it was the third. 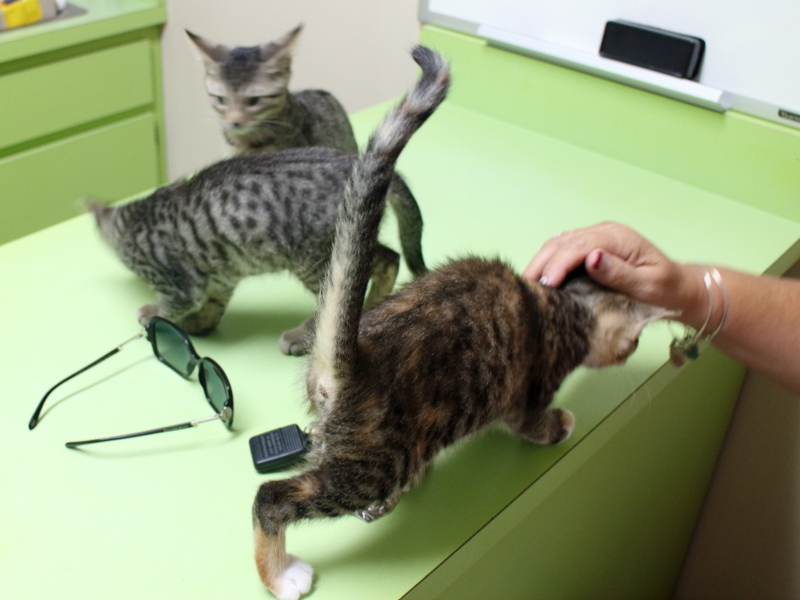 After we settled in for a bit and met the little gold kitten that they decided to adopt, we took a short ride to the vet’s office where Felice works. That is where the two cats were that needed a home. 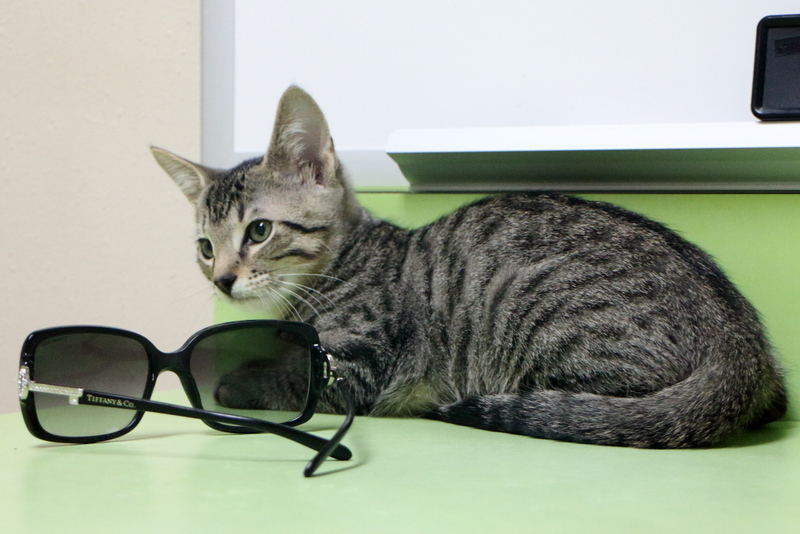 We first went to an examination room that held the female kitten that needed a home. Her two brothers were in there also and all three of them were very cute and playful. The female had unique markings. She had sprinkles of gold but she wasn’t technically a Calico or Tortie. I don’t know exactly how that works but Felice says in both cases they have black patches, which this kitten doesn’t have. Wikipedia does mention a “Tortie-Tabby” or “Torbie” which is what this kitten might be. 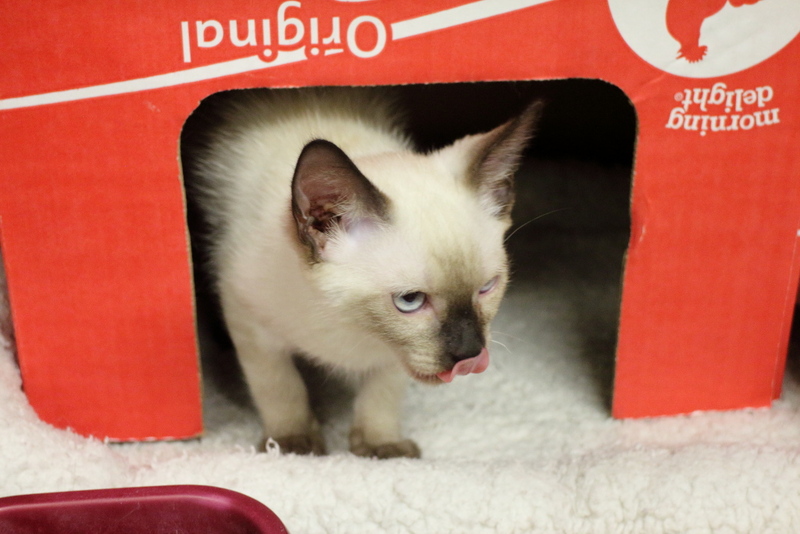 Next we visited the Siamese kitten. This one was a bit shy at first but warmed up very quickly and had a nice loud purr. Rose was a bit disappointed in him for some reason. She said he looked sickly and she noticed he wasn’t the same kitten that she saw in the photograph. I didn’t think he was sickly. In fact, he seemed somewhat energetic. I didn’t know this then but there were actually two Siamese kittens that needed a home. They were brothers that were left in a carrier at Wal-Mart on Memorial Day when they were about six weeks old. Also in the carrier were three other kittens from a different litter that were about eight weeks old. Felice picked the one that seemed the friendliest and brought it to her work to have him fixed, just in case we decided to take him home. After I shot the above video, we put the kitten on a table where a very overweight gold cat with bent whiskers was hanging out looking for attention. This cat was extremely friendly and we considered adopting him but Felice said he likes kittens but he does not get along with adult cats. We joked that he eats them, which was not very nice (even though we laughed). We decided to think about it and we went back to Felice’s house and talked while her husband, Jeff, made his famous chicken barbecue. While we were waiting, the gold kitten was out playing and he really seemed to take to me. I was petting his belly and he was “fighting” my hand. He then lied on my lap and purred and purred and purred. I was thinking about what a couple of commentators said on my last post. They said “let the kitten choose you,” or something similar. 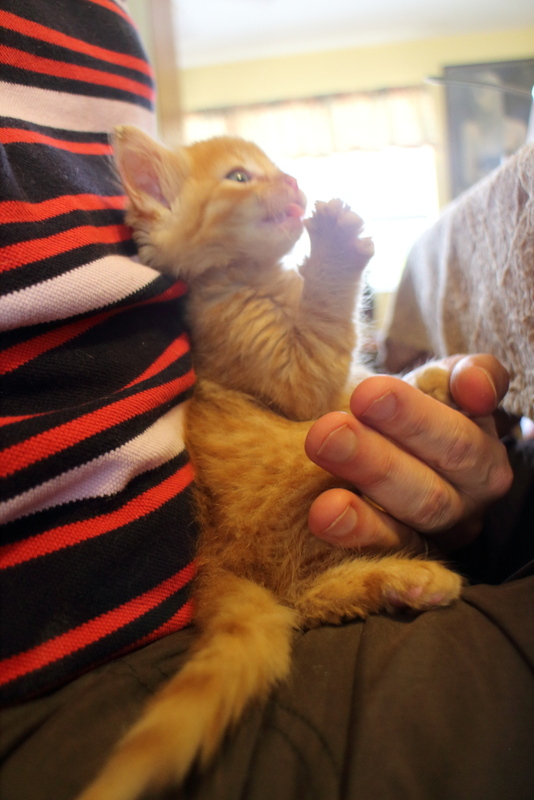 It seemed this kitten was choosing us but Felice and Jeff already chose to adopt him and wouldn’t give him up. In truth, I couldn’t blame them. Rose decided she didn’t want to settle for a kitten she wasn’t sure about and I suggested that we go back and look at them both one more time. It was agreed that we would do that but when it was time to go, Rose’s mom was not feeling good and wanted to go home right away so she could “take a pill.” So that was the end of that, but we did pay the $60 for the kitten’s vet bill. it was the least we could do for leaving without a kitten. If you have made it this far, I will tell you there is more to this story, so check back again soon. 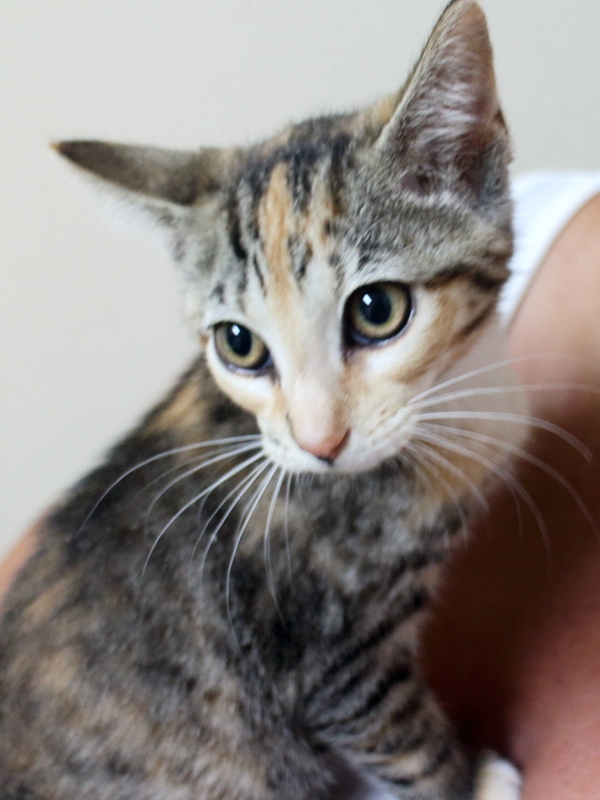 This entry was posted in Uncategorized and tagged adopt, cute, kittens, torbie on July 4, 2016 by Charles Huss. Yes, the kitten is a torbie. A torbie is a tortie with stripes. Zoey is a torbie. I never noticed that about Zoey. It must be somewhat rare. Shame about the two kittens but that gold one is quite adorable. Agreed….torbie like our Ivy. 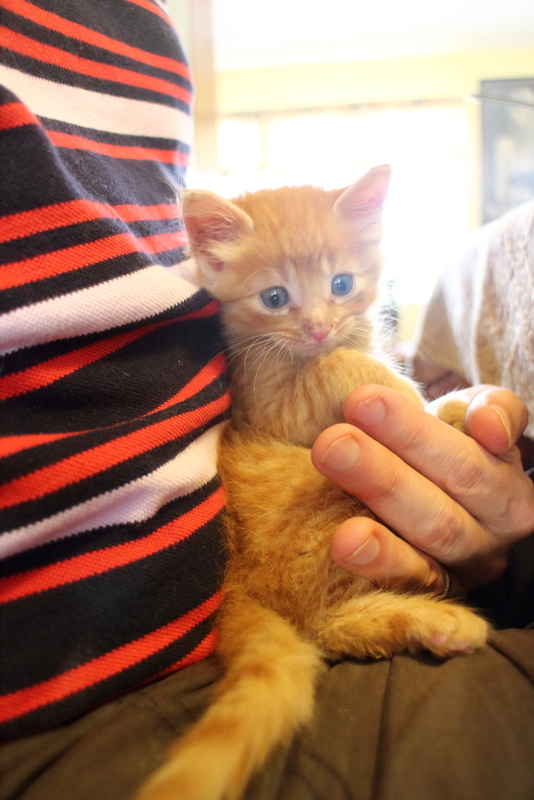 Have to agree – that ginger kitten is adorable. Yes, it is too bad we couldn’t take him but he has a good home. Hmm, no kitten at all. Quite surprising, but the best way if you are not sure. They all were really cute, I hope they will find good homes soon. You left us hanging! I can’t wait to hear the rest. I can’t wait to write it. 😉 Just need to find time. That was kind of you to pay the kitten’s vet bill. That orange baby looks like a mini Chris. I didn’t know Chris at that age but he probably acted that way. That’s too bad. 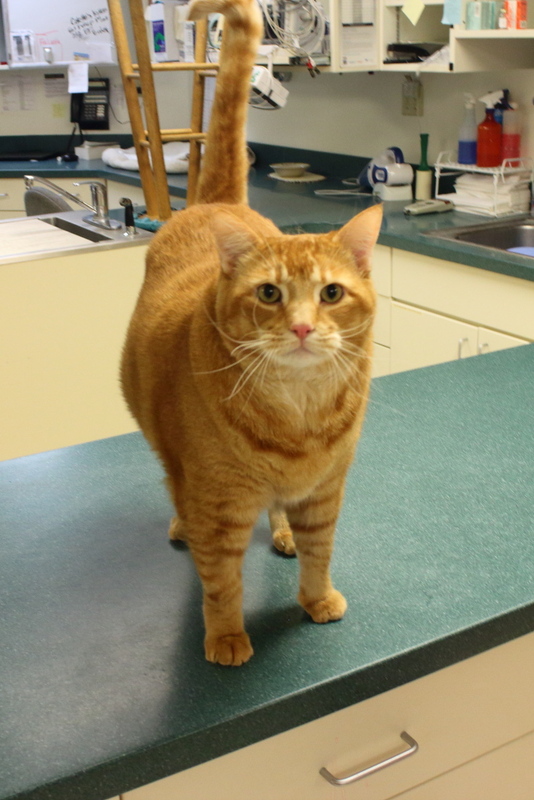 Our Chris is a pain but super affectionate. Well I’ve always said things happen for a reason……..so there was a reason you didn’t get a kitten this time around – when it’s meant to be – it will be! 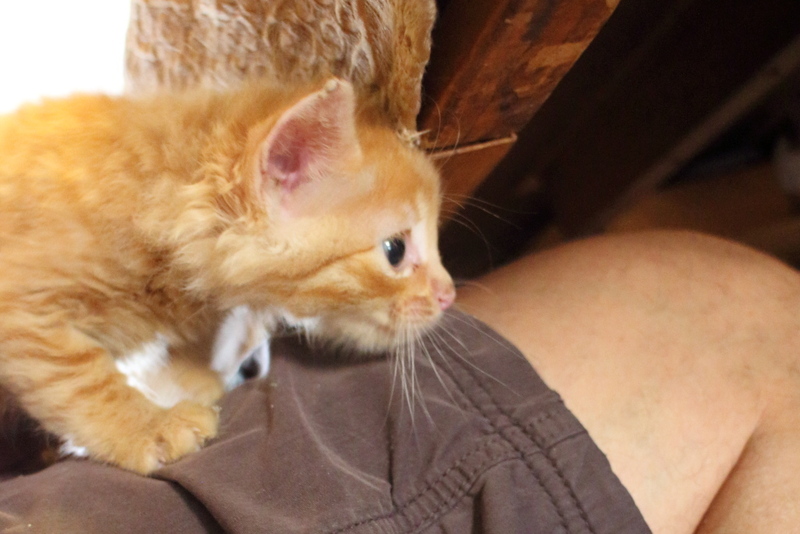 That gold kitten is BEYOND adorable though – what a cutie!!! 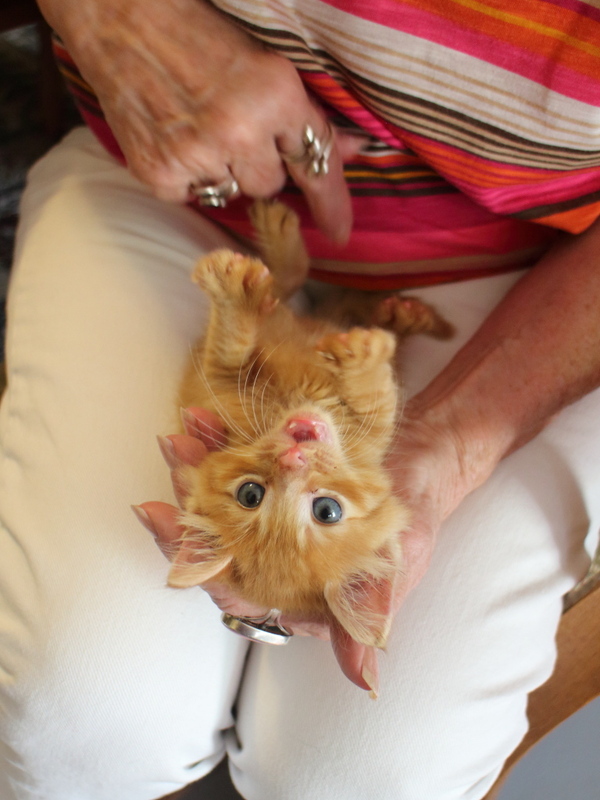 They all were sweeties – but kittens usually are precious. We’ll wait to hear Part Two of the story! Yes, that gold kitten was a cutie. I can see him growing into a naughty boy like Chris. Well now I need to know what the rest of the story is!